If you're feeling peckish on Friday, it might be because it's National Fried Chicken Day on July 6. That is an intensely specific food holiday. Nonetheless, it's worth celebrating because, as always, it means you can find some cheep food. It lands on a great day, especially if you're back at work Friday because the Fourth of July fell in the middle of the week. Treat yourself to a long lunch with some greasy food. To help you hatch the perfect plan for National Fried Chicken Day, here are some of the day's best deals. The deal: The Chicago location of Boxcar Betty's is doling out free sandwiches on National Fried Chicken Day if you make a donation to the Greater Chicago Food Depository, per the Chicago Tribune. Get a free fried chicken buttermilk biscuit sandwich from 6:30-8:30am or a choice of the Boxcar sandwich and classic Betty from 4:30-6pm. Plus, every other Boxcar Betty's location is offering $2 chicken sandwiches from 3-5pm. Proceed will be donated to the Lowcountry Food Bank. The deal: It's not on National Fried Chicken Day, but just a few days later you can dress like a cow and get free food for the chain's annual Cow Appreciation Day. Dress in any kind of bovine attire and you'll be given a free entrée. The deal: Everyone wishes Popeyes was open all day and night. For National Fried Chicken Day it will be. Restaurants in New York and Los Angeles will be open for 24 hours, and you can pick up $0.24 drumsticks from midnight to 7am at participating locations. 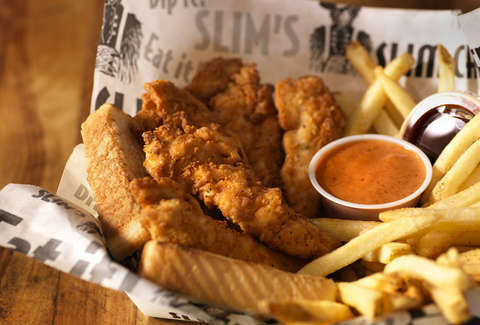 The deal: Pick up the chain's popular Chick's Meal -- chicken tenders, Texas toast, one side, dipping sauce, and a drink -- for just $5. It'll be available at every US location. The deal: They're not making it easy on you, but you can take $5 off a 12-piece Super Tailgate with three "picnic fixin's" and a half gallon of iced tea. 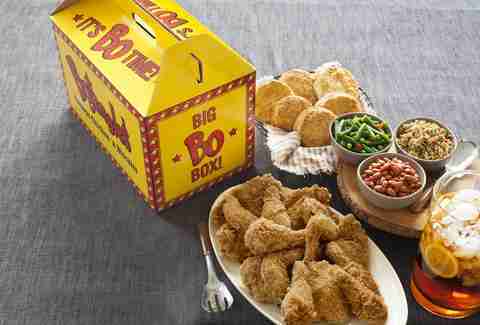 To get the deal you have to tweet at @Bojangles1977 with the chicken leg emoji and the hashtag #ItsBoTime. Then you'll get a coupon for the discount, but you'll have to actually print out the coupon to redeem it. The deal: While there's no National Fried Chicken Day promotion, the wing hub offers discounts on boneless wings every Thursday for Boneless Thursdays so you can start your Chicken Day celebration a day early. The deal: In honor of the chicken holiday, Bruegger's is offering $2 off sandwiches to Inner Circle members with a coupon. Plus, if you aren't an Inner Circle member already, you get a free bagel with cream cheese just for signing up. The deal: In honor of the World Cup, you can get 10% off all online orders with the code "FIFA2018." The deal: Pick up a 10-piece chicken nugget for $1.69. The deal: Drop into Carrabba's happy hour for cheap drinks and half off its wood-fired Italian wings app, per GoBankingRates. The deal: Sign up for the taco joint's Raving Fan Club, and you'll get two free grilled chicken tacos, plus you'll get a free shake on your birthday. The deal: There's no deal available, but Church's is running a promotion that will make you feel good about yourself (not a given while over-indulging in fried chicken). In support of 4-year-old Austin Perine's Show Love Foundation, Church's will donate $1 every time someone posts an image of their chicken on social media and tags @Churchs with the hashtags #ShowLove #Churchschicken #NationalFriedChickenDay. The deal: The Philadelphia-based chain has created a limited edition BBQ Fried Chicken Sandwich with boneless fried chicken breast, BBQ sauce, summer slaw, and cheese on a roll. More Fried Chicken Day Deals? If you know of National Fried Chicken Day freebies and deals we missed, email us at news@thrillist.com and we'll add 'em here.